Beautiful Top Grain black leather belt with your choice of Silver or Brass buckle. Beautiful Top Grain Black Leather belt with black hardware. Beautiful Top Grain Brown Leather belt with your choice of silver or brass hardware. A beautiful belt that will lighten and soften over time developing its unique personality. This is a great belt. Black Veg tanned leather with awesome domed studs that we antique to a cool gunmetal color. You might get tiny touch of rust color in the antiqued studs. Black leather belt with your choice of silver or brass for your hardware color. Brown leather belt with your choice of silver or brass for your hardware color. Black leather belt with matte black rivets and rings. Crackle white leather belt with silver hardware. Beautiful Top Grain Black leather belt that will last and look great. Leather brown belt with your choice of silver or brass hardware. Classic. Gorgeous. The Best Quality. Genuine Leather black belt. Double weave special edition design with a little extra hardware. Beautiful Top Grain black belt, double weave deign with your choice of accent color. Beautiful Top Grain Brown Leather belt, double weave deign with your choice of accent color. Genuine Leather brown belt, "X" weave deign with your choice of accent color. 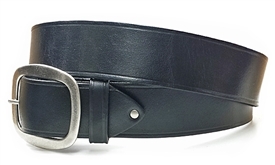 Genuine Leather black belt with your choice of silver or brass hardware. This charge is to ensure that your order is shipped 1 to 2 business days after payment has cleared.